Switzerland’s Lara Gut closed the gap on Vail’s Lindsey Vonn in the overall World Cup chase on Sunday, winning a super-G at Garmisch-Partenkirchen, Germany, with hometown favorite Viktoria Rebensburg in second and Vonn in third. 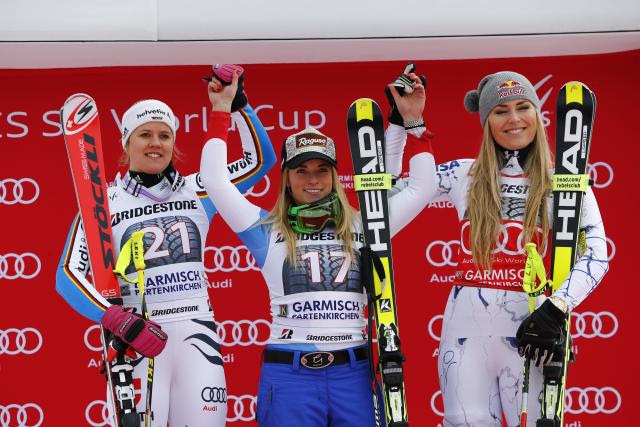 Gut grabbed 100 points for the win compared to Vonn’s 60 for taking third, narrowing the gap by 40 points. With Sunday’s win, Gut’s 973 total points is now 87 points behind Vonn’s 1,060 points in the back-and-forth chase for Vonn’s American record fifth overall World Cup title. Rebensburg is third overall with 820. Vonn was also gunning for her women’s record 77th career win and her 10th of the season as she shoots for the season record of 14 victories set by Switzerland’s Vreni Schneider during the 1988-89 season. Vonn holds the record for the second most wins in a season (12 during the 2011-12 season). Vonn settled for third Sunday after making a brilliant recovery five gates from the finish, when her right ski went airborne after hitting a bump in the snow. “The snow was soft, like spring,” Vonn said. “I didn’t risk everything, I probably could have, but I feel like I’m older and wiser now, and to get to the finish healthy and be in third is still a pretty darn good day. Vonn, several other American racers and the coaching staff were planning to hang out at a U.S. military base in Garmisch with a large contingent of American military members and their families to watch the Denver Broncos and the Carolina Panthers in Super Bowl 50. “The Broncos game is tonight and if they win, it’ll make up for my third place,” said Vonn, a huge Broncos fan. Up next for the women are downhill and combined races in Crans Montana, Switzerland, Feb. 13-14. Vonn has several more shots at getting the five wins she needs to tie Schneider for the most wins in a season. A speed specialist, there are four more downhill races, six more super-G races and three more combined events.